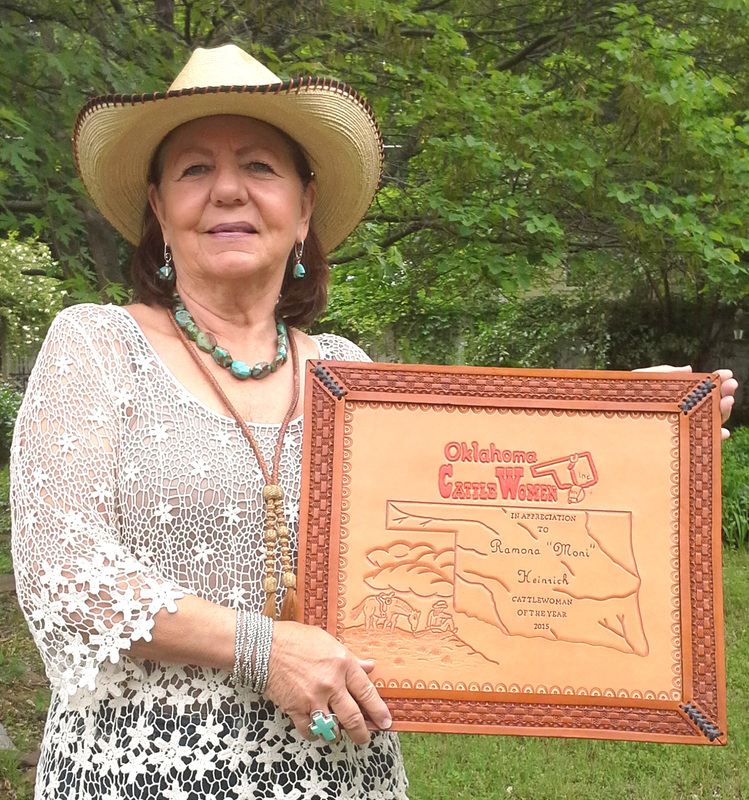 Past President of the Washington County CattleWomen, Moni Adcock Heinrich, is Oklahoma’s 2015-16 CattleWoman of the Year. She sat down recently, to share how a desire to expand her circle of friends, led her on a path toward leadership in the CattleWomen’s Association on the county and state level. Heinrich, who lives near Ramona, was out of state when the Oklahoma CattleWomen’s (OCW) Convention got underway in Oklahoma City last July. Ddee Haynes, an OCW member and past OCW President and past CattleWoman of the Year, gave Heinrich the good news. Heinrich was surprised to say the least. “I was in shock. I was so honored to be put in a category of women that I admire, who had mentored me,” she said. Heinrich explained how her membership in the CattleWomen organization began. She was single when she returned to Oklahoma after living in Arizona, Wyoming, Texas and Utah for three decades, and was looking to expand her circle of friends. The Washington County CattleWomen, which meets monthly for lunch at various locations around Bartlesville, is much more than a social gathering. In 2008, Heinrich became the Washington County CattleWomen’s President for a four-year term. “It was a great learning experience and we had a great board and team to work with. We held an FFA (Future Farmers of America) speech contests, an annual Beef for Father’s day essay contest in the Caney Valley, Copan and Dewey school districts. “The CattleWomen hold beef recipe demonstrations at the grocery store, Marvin’s, in Dewey at which they hand out beef samples, recipes and cattle industry literature. After completing her four-year term as President at the county level, Heinrich expanded her volunteerism at the state level. She is currently serving as Secretary of the OCW. “Some of the OCW projects are the Oklahoma Beef Ambassador Contest for ages nine through undergraduate, which has novice, a junior and senior divisions. This competition includes a media interview and consumer demonstrations,” she explained. OCW has academic scholarships as well, Heinrich said. “All of our monies go back to our youth in one way or another. Our monies are geared to support our youth and collegiate CattleWomen. “One of our biggest fundraisers is the beef tent at the Tulsa State Fair, where the Oklahoma CattleWomen in conjunction with the Oklahoma Cattlemen’s Association, sell ribeye sandwiches. “The Oklahoma CattleWomen usually have a ‘Beef for Heroes’ cook-off and beef cooking demonstration at the annual Home and Garden Show in Oklahoma City. “The Oklahoma CattleWomen also serve a free beef luncheon in Oklahoma City for Agriculture Day at the Capitol. The luncheon is on the rotunda floor and everything there is ‘Made in Oklahoma,’” Heinrich said. Heinrich talked about her childhood growing up on a ranch. “I grew up on the Roy E. Cobbs Ranch east of Ramona. We moved there when I was in the third grade. My dad was a foreman and I’m number nine of 12 children of Elwood and Helen Adcock. “It was a working ranch and everyone did their part. We all rode and it was a privilege when we helped work cattle and did ranch work. Youngsters helped by pushing cattle through the chutes. Later, when I was old enough, I rode my own horse and gathered cattle,” she said. Life was simpler then. There were no game systems or cell phones for the Adcock children. “Our playground was the creeks and the woods,” she said. “We always a big garden of potatoes, green beans, corn, peas, and I have not-fond memories of shelling peas or snapping beans, but I’d give anything to do it with her now,” she said wistfully. In their later years, they had one of the best strawberry gardens around. In Arizona, Heinrich was a member of Superstition Wilderness Search and Rescue, which responded to requests from the Pinal County Sheriff’s Department’s to aid in finding lost and injured hikers. She is also a certified presenter of Hug-a-Tree and Survive, which teaches children how to not get lost and how to stay safe if they become safe in the wilderness. She has educated hundreds of school children over the years in Arizona and Oklahoma. The Washington County CattleWomen meet on the fourth Monday of the month in Bartlesville. Locations and times may be found on the Washington County CattleWomen’s Facebook page. The Oklahoma CattleWomen meet quarterly. Locations and times are on the Oklahoma CattleWomen’s Facebook page and at http://www.okcattlewomen.org.